This contemporary sofa will be the perfect centerpiece in your living room. Low profile track arms and tapered block wood feet create a modern look. 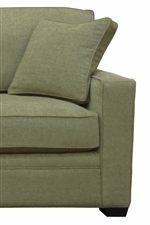 Plush cushions with welt cord trim offer comfort while maintaining a tailored look. 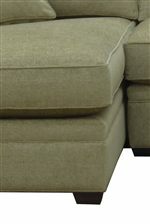 This high quality two over two cushion sofa is made in America, and built with quality materials and techniques to stand up to everyday use in your home. The 0693 Contemporary Stationary Sofa with Track Arms by McCreary Modern at AHFA in the area. Product availability may vary. Contact us for the most current availability on this product. Seat Back Two Plush Back Cushions with Welt Cord Trim. Back Height is 32".